The Professional Computer Solutions Java Tool Kit ['jFormTK'] consist of a controlled set of Java objects as defined in the "Framework" document [ see ]. Each 'jFormTK' object has a "Presentation" 'Look & Feel'. The Look & Feel 'jFormTK' parameters are encapsulated in the JLAF Class. 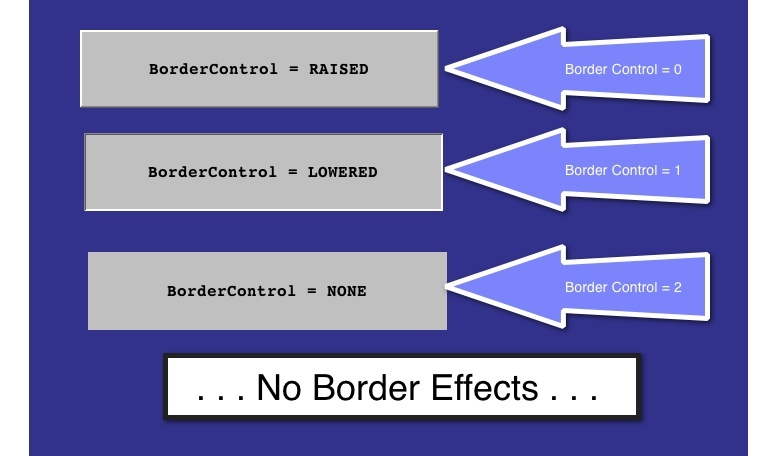 For the 'LineBorder' range of -1 to -15, the JLAF shall produce "Custom Borders" using the Java "Compound Border" functionality [ see Gallery below]. This color is also used as the primary color in the "Custom Borders" [	see Gallery below]. The 'jFormTK' Database [JFormTKDB] consist of 2 collections of 'jFormTK' parameters designed to create the 'jFormTK' kernel system level control parameters [ see ]. One collection contains all the JLAF control parameters used by the 'jFormTK' Kernel. There are many, many objects and object JLAF instances that may be adjusted by the 'jFormTK' Application developer in accordance with the developers Look & Feel presentation taste and the 'jFormTK' Application requirements. However, in reality all these Look & Feel controls are, by Professional Computer Solutions design, based on a small set of Look & Feel primitives. This approach allows the 'jFormTK' Application developer to easily customize the Look & Feel just by setting a few JLAF controls. These controls are called "Primitives". For example, the Survivors List PLUS [SLPlus] Professional Computer Solutions 'jFormTK' Application is designed to be marketed to a huge "horizontal" market as a stand alone Application. In addition, PCS shall also license SLPlus to individual companies who may use the application as a marketing tool. The licensed SLPlus apps shall be baselined from the commercial SLPlus application with licensee specific application name, their company logo and "Primitive" Look & Feel controls as a function of the licensees company colors. In a 'jFormTK' form the field assumes a different 'Look & Feel when it receives the focus, i.e. when it the active field awaiting data entry by the end user. By 'jFormTK' default the background is white and the foreground is red. In a 'jFormTK' form and other dialog windows there shall be a list of items for the end user to make a selection from. The 'list' Look & Feel may be altered by the 'jFormTK' developer. 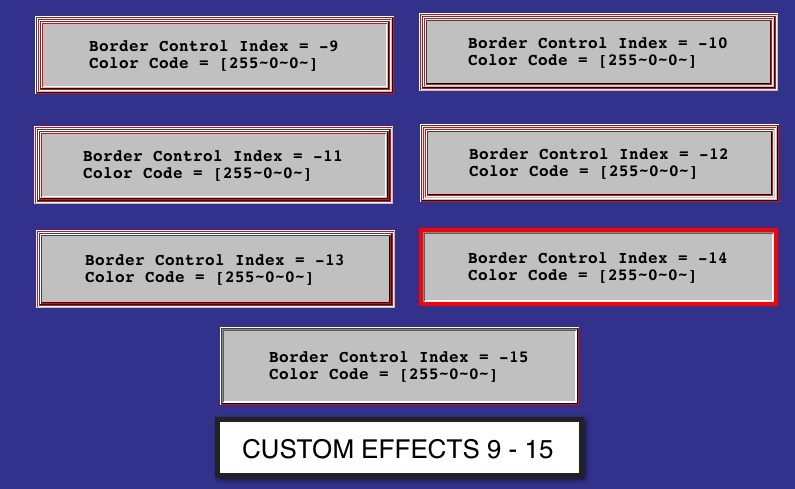 The following displays are designed to illustrate the different "Border" Look & Feel's which are available via the JLAF 'BorderControl' parameter. In these images I used the 'jFormTKDB' kernel defaults for the 'appBackground', 'appForeground' and 'appFont' controls. I used the color 'Red' for the 'LineBorder' so that the line and 'custom' borders will stand out more. The first image shows the 'jFormTK' "showPanel" dialog with an annotation to highlight the line variable while viewing additional displays. the thickness of the line border. Show the Raised, Lowered and No Border effects. 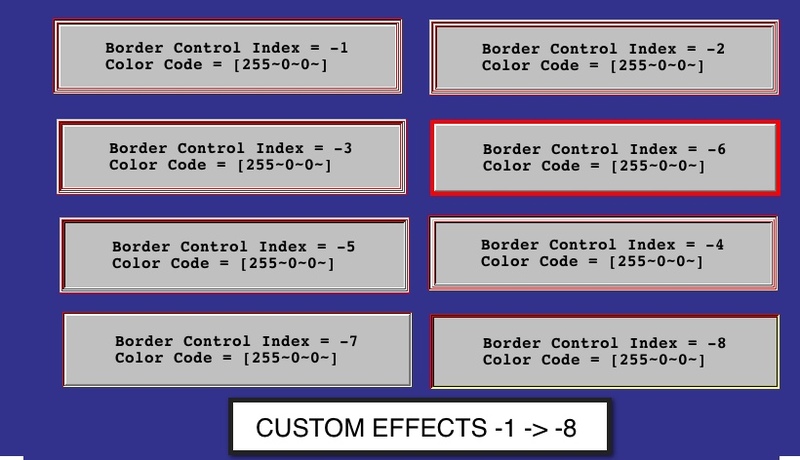 The following displays demonstrates the 'jFormTK' "Custom Borders" produced via the Java "Compound Border" feature.